We have highlighted quite a few different surveys conducted by the British Promotional Merchandise Association (BPMA) in the past. Some of the highlights from those studies included proof that promotional products actually do work to help consumers remember a company’s brand, increase positive sentiment towards that company, and have the same or better ROI than other forms of advertising. 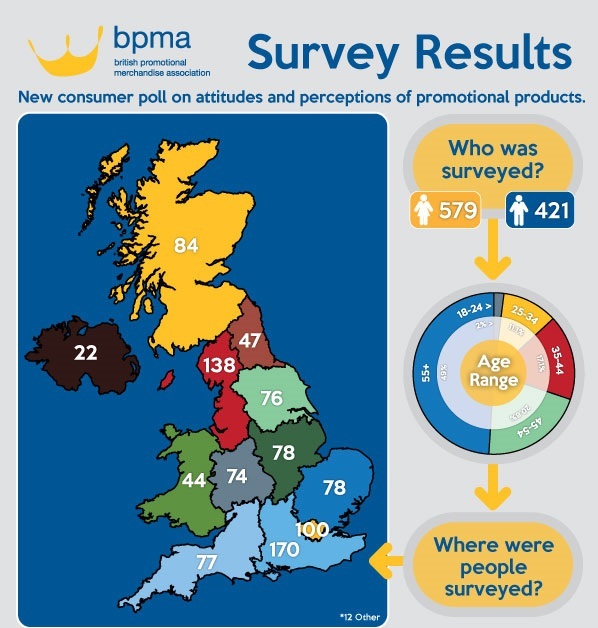 The BPMA has conducted new research in the area of promotional products and surveying recipients. 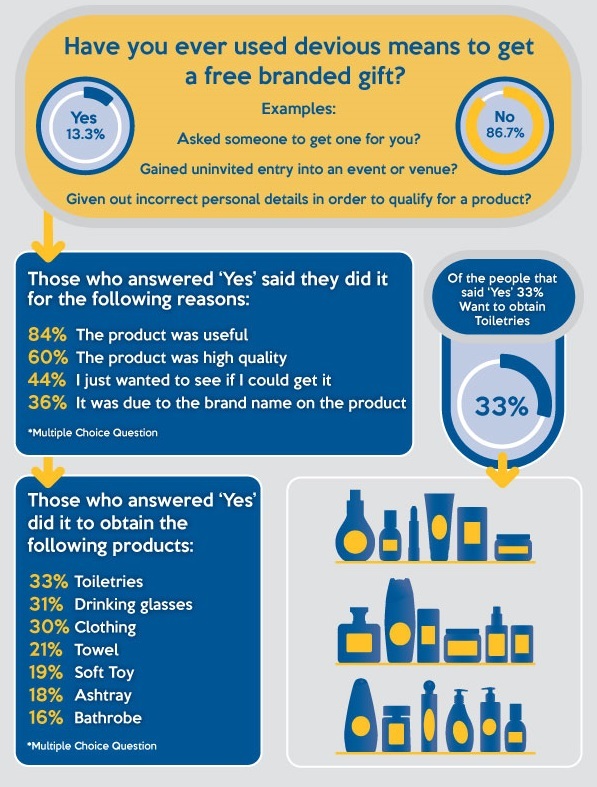 The following infographic shows the results of that survey and tells us some new and interesting information about how consumers perceive trade show giveaways. 1,000 consumers who received promotional merchandise took part in the latest survey from the British Promotional Merchandise Association. The goal of the survey was to ask people who had received branded merchandise about their impressions and experience. 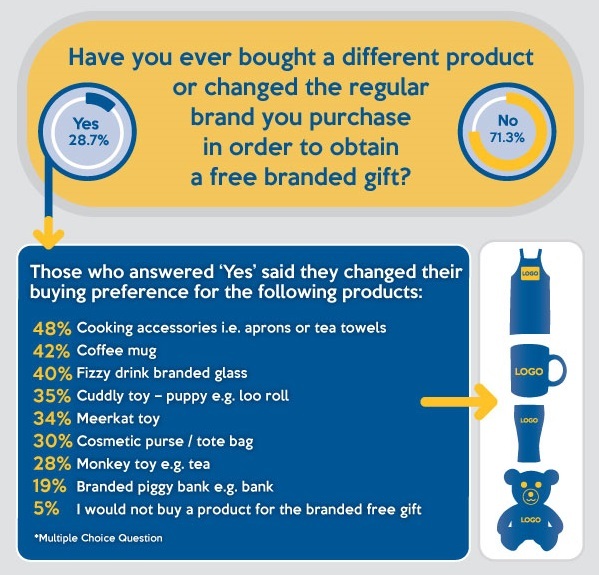 As you will see below, the poll results were very interesting and show insights into when consumers expect to receive promotional products and how free branded gifts can influence their purchasing decisions. Which Promotional Products are Most Popular? 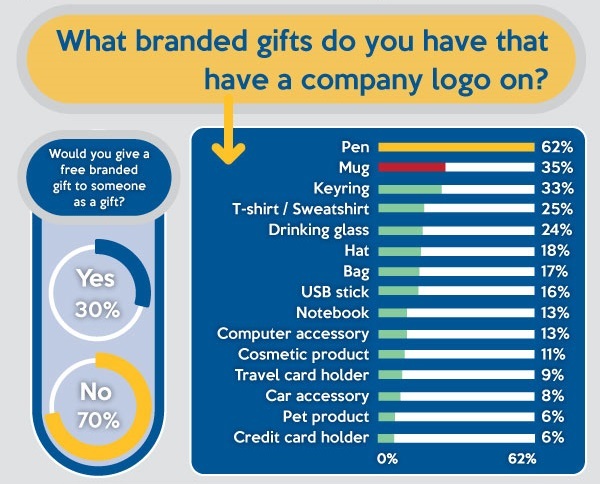 Survey participants were asked if they have any branded gifts with a company logo on them. At least 62% of participants in the survey did have branded promotional products with a logo on them. Promotional pens were the most popular at 62%. 35% of the survey participants said that had a branded mug, and 33% said they had a key ring with a company logo. 25% of respondents said they had some form of braded clothing like a t-shirt or a sweatshirt. Other popular promotional products also made the list such as drinkwear, hats, bags, USB memory sticks, and other computer accessories. 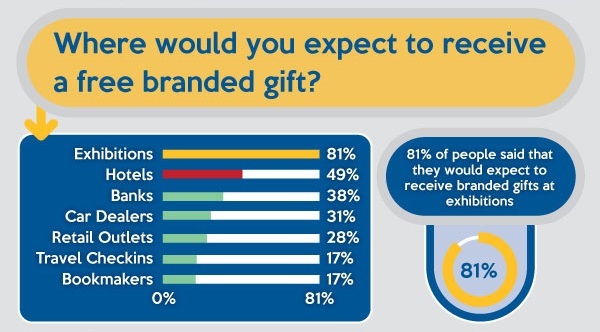 When asked if they would give a branded gift they received for free as a gift to someone else, 30% said they would give a promotional product away as a gift. Where Would You Expect to Receive a Free Branded Gift? This question shows significance for companies who exhibit at trade shows because an overwhelming 81% of those surveyed said they would expect to receive a promotional product at an exhibition or trade show. However, it can also be important for companies in other industries because you can stand out by offering a free gift with your logo on it. Which Branded Gifts are the Best? We here at Gopromotional.com always talk about the importance of relevance to your brand when choosing a promotional product. If you are a safety or insurance company, a branded first aid kit or promotional umbrella can help drive home the idea that you are there to help protect your clients. If you are a car repair company, branded car accessories go right with your brand and help your customers remember to come to you for their car repairs. Choose a promotional product that is relevant to what you do and it will be much more effective. Good quality is also a very important trait for promotional merchandise. Even though it is a free branded gift, if it is low quality, chances are that is what the recipient will think of your brand. Also following on the scale here, but not quite as significant are attractiveness and personalisation to include the recipient’s name. How Far Would You Go to Get a Free Promotional Product? At what lengths to some people go to get a free promotional gift? That was what the survey aimed to answer. Interestingly enough, they found that people were willing to be quite devious in order to acquire a free branded gift. Over 13% of those surveyed said they would do something like ask someone else to get the gift for them, go into a venue uninvited, or give out incorrect personal details so that they could get a promotional gift. Have You Changed Your Mind on a Purchase for a Branded Gift? Over 28% of those surveyed said they would change their purchasing behaviours in order to receive a free promotional gift. . This is important for companies to understand because promotional products can be a very inexpensive yet persuasive form of advertising. Some of the top types of branded products that would influence a change in a purchasing decision include cooking accessories, coffee mugs, branded drinking glasses, and cuddly toys.